In summertime you can’t go wrong with ice cream to cool you off on a hot day. The sweet frozen concoction makes you happy inside and out. Well, maybe not your rear but that is a different story. There will be time to work that off in the pool. This recipe comes from a dear friend of the family. She lived down the street from me when I grew up and was such a fun mom. My siblings and I would run down the street to play at her house and her kids would rush up to our house to play. It was classic fun in the summertime. Sometimes she would make a delicious dessert and my all time favorite was this tasty treat. 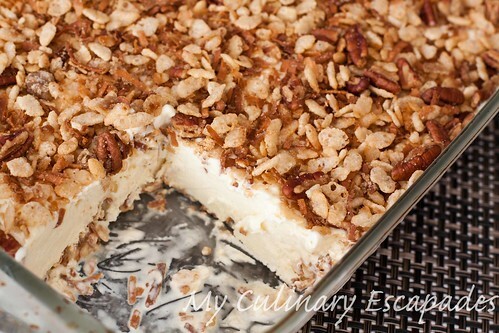 The toasted coconut with the soft pecans was such a wonderful combination on top of creamy vanilla ice cream. Usually I make this and keep topping and keep it in a plastic container in my pantry but today I decided to make it the traditional way. This way is great but trust me when I say you are going to want to keep some of this on hand for your midnight ice cream treats. 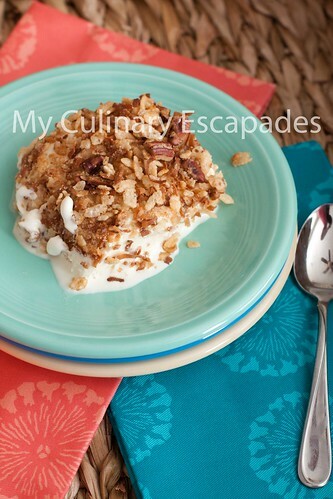 Combine rice cereal, coconut, pecans and melted butter. Spread on a cookie sheet and toast in a 300 degree oven for 30 minutes. Add brown sugar as soon as you take it out of the oven and stir to blend. Put 1/2 of the mixture in the bottom of a 13X9 pan. Spread melted ice cream over mixture and top with the other half of the mixture. Chill in freezer for several hours until firm. Cut into squares and enjoy.